Triad Stage, in partnership with UNC Greensboro, brings to life one of Broadway’s most iconic musicals. The world is at war, and on an island in the South Pacific the U.S. has created a military stopover for young men on their way to the front lines of battle. But love is also in the air. Emotions run high as a Midwestern nurse and a young lieutenant each navigate the treacherous waters of unfamiliar cultures and new romances. Winner of the Tony Award and the Pulitzer Prize, Rodgers & Hammerstein’s South Pacific will sweep you away with the delightful cast of characters and unforgettable songs like “Bali Ha’i”, “I’m Gonna Wash That Man Right Outa My Hair,” and “Younger Than Springtime.” Triad Stage invites you to be part of its most ambitious production to date. Triad Stage will honor American service men and women for their contributions to our country and community at performances of South Pacific. Community nominations were accepted throughout the month of August, and nominees will be contacted and invited to attend and be recognized. Get a sneak peek at the show and a discount code for tickets! Bring a story, bring a friend, or simply listen in to an evening of stories. Theme: "This nearly was mine." 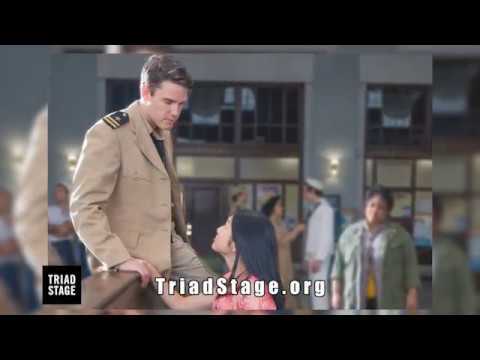 Triad Stage - Kristin Wetherington and Dan Callaway. Photo by VanderVeen Photographers.Triad Stage - Hannah Kevitt and Will Branner. Photo by VanderVeen Photographers.Triad Stage - The cast of SOUTH PACIFIC. Photo by VanderVeen Photographers.Triad Stage - The cast of SOUTH PACIFIC. Photo by VanderVeen Photographers. For a few brief minutes before the curtain rose, Calvin Morrow became the star of the show. With his B-1 U.S. Navy Band patch and Navy ribbons displayed on his blue suit, a beaming Morrow basked in cheers and applause from the Triad Stage audience. Gertrude Morrow joined the applause as her husband of 67 years stood on stage, a cane the only concession to his 93 years. Fourteen months ago we moved to the North Carolina coast. Our friends ask why, with all the entertainment venues in our area, we travel four hours each way to Greensboro to see a play. I saw the play “South Pacific” at Triad Stage last Sunday. I have yet to be disappointed in anything we have seen. Sometimes revisiting an established theater classic doesn’t pay off: too many familiar moments. That’s not the case with Triad Stage’s current revival of Rodgers & Hammerstein’s 1949 musical “South Pacific,” based on James Michener’s 1947 book. This well-cast, energetically performed production brings back the manyattributes of the original that made it such a hit. A new season, an American classic and a Greensboro theater. Sept. 17 kicked off the 2017-2018 season of Triad Stage with the theater’s largest production to date – “South Pacific.” This production is directed by Preston Lane, the founding artistic director of the Triad Stage, and is in partnership with UNCG’s Concert and Lecture Series. “South Pacific” will run until Oct. 15. When the Broadway musical South Pacific premiered in 1949, its commentary on race and depiction of relationships between different ethnicities was such a striking departure from the genre that critics and audiences alike deemed it inappropriate. In similar fashion, the southeast regional professional theater Triad Stage seeks not just to repeat plays, but to reimagine them. And it is doing just that with South Pacific, which runs Sept. 17 - Oct. 15 in Greensboro, North Carolina. Big Broadway musicals are something of a departure for Triad Stage, which built its reputation on drama classics and original productions. But there is an exception to every rule, and for Triad Stage, “South Pacific” fits the bill. Triad Stage, in partnership with UNC Greensboro, brings to life one of Broadway's most iconic musicals. The world is at war, and on an island in the South Pacific the U.S. has created a military stopover for young men on their way to the front lines of battle. But love is also in the air.